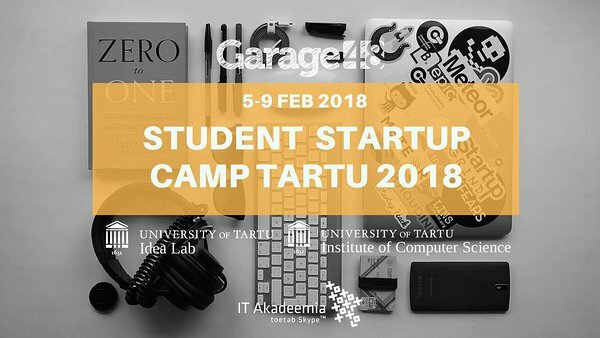 The Student Startup Camp (SSC) is happening in Tartu 5th to 9th of February! Together with the Garage48, we are bringing you the annual entrepreneurship boot camp designed to build your idea into a working prototype and to learn the basics of launching a tech startup. You will be guided through the most important steps by active startup entrepreneurs and trainers who collaborate to create a hands-on learning experience. IT Academy is offering up to 10 travel grants for students from Estonian higher education institutions who are not studying in Tartu. The travel grant covers only hostel accommodation in Tartu. Students enrolled in full-time studies in the following institutions are eligible: Tallinn University of Technology, IT College, Tallinn University, Tallinn Polytechnic School and Estonian Academy of Arts as well as students from University of Tartu's Narva and Pärnu colleges.